My car had to have a new engine. A processor or portion of a program that determines how the program manages and manipulates data. 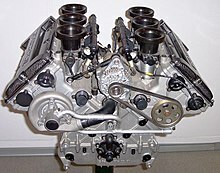 The term engine is most often used in relation to a specific use. Borrowed from Anglo-Norman engine, Old French engin (“skill, cleverness, war machine”), from Latin ingenium (“innate or natural quality, nature, genius, a genius, an invention, (in Late Latin) a war-engine, battering-ram”), from ingenitum, past participle of ingignō (“to instil by birth, implant, produce in”). Compare gin, ingenious. Flattery must be the most powerful Argument that cou'd be used to Human Creatures. Making use of this bewitching Engine, they extoll'd the Excellency of our Nature above other Animals [...]. Therefore this craftie engine he did frame, / Against his praise to stirre vp enmitye [...]. Anything used to effect a purpose; any device or contrivance; an agent. You see the ways the fisherman doth take / To catch the fish; what engines doth he make? (transitive, dated) To equip with an engine; said especially of steam vessels. Vessels are often built by one firm and engined by another. (transitive, obsolete) To assault with an engine. (Can we date this quote?) T. Adams. (transitive, obsolete) To contrive; to put into action. (transitive, obsolete) To rack; to torture. engine in Webster’s Revised Unabridged Dictionary, G. & C. Merriam, 1913.
engine in The Century Dictionary, New York, N.Y.: The Century Co., 1911.